McMurry University traveled a long way to witness Makana Stone’s excellence live. The Texas-based War Hawks trekked 1,801 miles from Abilene to get to Spokane, then got thrashed by the Coupeville grad and her college mates. Having made the journey from Walla Walla for the non-conference bout, Whitman College made sure the return trip would be a pleasant one, savaging McMurry 83-57. The Blues, who were led by Stone’s 18-point, 7-rebound performance, are now 3-2 heading into the start of Northwest Conference play. While Whitman heads home, McMurry will hang around the Whitworth Fieldhouse in Spokane and play the arena’s home team Sunday. Saturday’s game, which was a tuneup before Whitman hosts league rivals Pacific and Willamette next weekend in Walla Walla, was a one-sided affair. The Blues flew out to a 9-0 lead in the early going before settling for a 22-11 advantage at the first break. From there, Whitman stretched the margin to 13 at the half and 20 after three quarters. Stone, who reached double digits in scoring for the fifth time in as many games this season, scored in every quarter as she amassed her game-high points total. 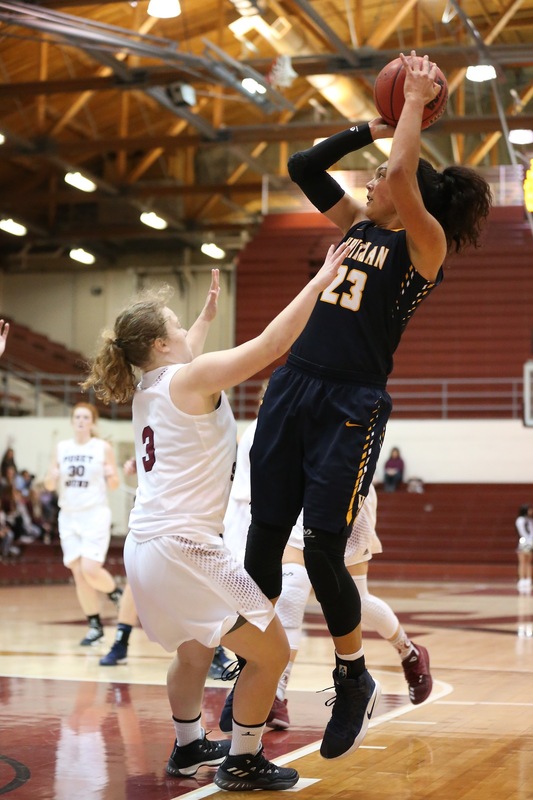 Shooting a solid 8-12 from the field, the Whitman junior scored 11 of her 18 points in the second half, with seven of them coming in the third quarter. She also blocked two shots, pilfered a steal and doled out an assist in 22 minutes of floor time. For the season, Stone tops Whitman with 89 points (17.8 a night), 42 rebounds and eight blocked shots. The former Wolf ace has seven assists and eight steals, and is shooting 55% from the floor (37-67) and 75% from the free-throw line (15-20).